If you’ve been following this blog or have trawled the recent archives then you know about virtual star parties on Google+, where astrophotographers put up real-time video images of celestial objects and a mixed group of professional and amateur astronomers and interested laypeople chat it up. Tonight I got to experience a virtual star party of a completely different sort: a binocular tour of the night sky as projected on the dome of the Samuel Oschin Planetarium at Griffith Observatory. I was invited along by Steve Sittig, a good friend who works at the Webb Schools here in Claremont, where he teaches science, serves as chapel director, and runs the observatory. 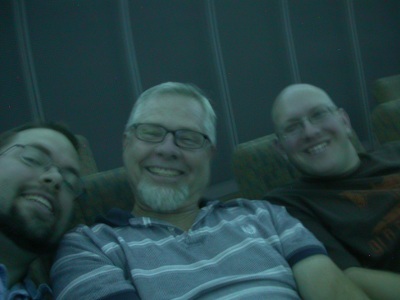 It is a curious lapse in my blogging that I haven’t covered any of the times that Steve and Andy Farke and I have passed an evening playing around observing with the big orange C14 in the observatory dome at the top of the Webb campus. We’ve chased comets and supernovae and had all kinds of fun–but those are stories for other posts. 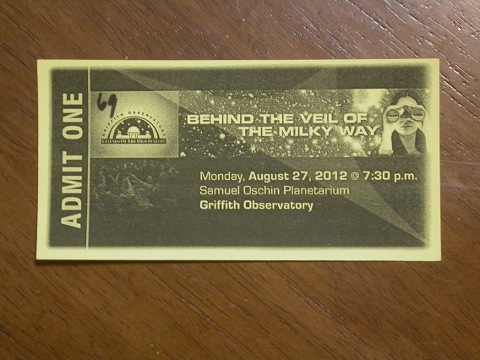 Anyway, Steve hooked Andy and me up with tickets to this evening’s virtual star party, and a little before 7:30 we marched into the big dome, took our seats, and got our binoculars ready. I also got a few snaps, including this slightly-better-than-Bigfoot-level handheld portrait of the three of us not looking dorky at all. I really didn’t know what to expect when the lights went down. I didn’t know whether the projector would project actual images of deep-sky objects, or just little groups of star-points that would mimic deep-sky objects, or maybe just the regular asterisms and constellation outlines. All that uncertainty was dispelled as soon as the lights went down and the stars came out. The presenter directed us to Orion with his red laser pointer and went into some well-rehearsed patter about how it’s a big molecular cloud where new stars are being born. I was off and running. From the first view of the Orion Nebula (M42), it was clear that this was going to be a lot of fun. The nebula was big and detailed and looked pretty darned similar to its actual appearance through binoculars under dark skies. I have to confess, I didn’t hang around for the whole Orion speech. I had stuff to see. I scanned south into Canis Major to look for the open cluster M41–and it was there, and looked legit. Followed the dog’s tail north and east to look for the closely paired clusters M46 and M47. There was only one glowing thing at their location, but there was something there and it was clearly supposed to be a star cluster, or maybe two close together. M35 in Gemini: there. Up to Auriga for M36/37/38: all there. And so it went. The presenter did give us a pretty good tour of the northern sky, and he got to a lot of the stuff that I had raced ahead to find, but there was always more. I was shocked at the detail and fidelity of the images. Now, to be honest, not everything was there. A lot of the smaller or dimmer Messiers were not there–I looked in vain for M78 and M79. But I was often pleasantly surprised. M44, the Beehive, was an actual swarm of projected stars, not a hazy picture, just as it should have been. Better still, M67–hardly what one would call a showpiece object–was also there, just a bit to the south. And all of these things were not mere blobs of light, but were individually different and looked pretty much like they actually do through binoculars. It was pretty darned impressive. I don’t know why I didn’t see this coming, since it was obviously technologically possible: the highlight of the evening was a tour of the Southern Hemisphere skies. We saw the Southern Cross and the Coalsack, the Jewel Box Cluster and the Eta Carina Nebula and the Southern Pleiades. I had seen these things before in binoculars, lying on the beach in Punta del Este, Uruguay, almost exactly two years ago. It was unexpectedly moving to get to visit them again, with binoculars, lying in much the same position in the reclined chair in the planetarium. After that we came back to the northern skies for the summer highlight objects, which were very familiar since I just saw them last week. We hit the usual suspects: M4, M6, M7, M8, M20, M24, M25, M17. I popped up to the tail of Aquila and bagged M11 (actually in Scutum for any pedants in the audience, but it’s most easily found by following the eagle’s tail). All in all, by the end of the night the presenter had pointed out about two dozen deep-sky objects, and I had found another dozen or so that went unremarked. It’s weird to think that the projector is presumably putting up images of these faint fuzzies all the time, even though most of them are below the threshold of naked-eye visibility. 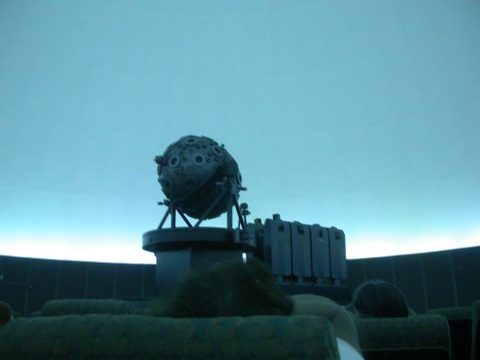 I am going to start sneaking my binoculars into the planetarium on a regular basis. When it was over, we all went out onto the observatory veranda to see what we could see in the real sky. Between the waxing gibbous moon, the regular LA light pollution, a bit of haze, and the modest aperture and magnification of our instruments, what we could see turned out to be “not very much”. We tried going right up to the fence and putting all the local lights behind us to try for the Andromeda galaxy and M13, but neither was in evidence. Oh well: the observatory staff did warn us that the real (Los Angeles) sky would be an unpleasant shock after the pristine projected sky. Steve said the projected sky was like what you see up in the Sierras, where the sky background is so black and there are so many stars that it’s easy to lose your way; the bright stars that mark the constellations are simply lost in endless fields of distant suns. The downside to virtual stargazing is just that: the endless fields of distant suns are not really endless. Using the binoculars allows you to see the projected stars and DSOs more clearly, but not the stars and DSOs between them. You can’t go very deep; there’s an inevitable limit and you hit it pretty fast. The Milky Way does not break up into a visually exhausting never-repeating parade of clusters, nebulae, asterisms, and rich fields of stars; it’s just a bunch of cloudy light projected overhead. You’re not really out there; the marvel is not at natural splendor but at human ingenuity, and you are, in the end, sitting in a big dark room using the world’s biggest sky app. Fun and interesting, for sure, but not nearly as rewarding as the real thing. I’m going to have some Superdome-sized Bortle-class 8 planetariums built with a projection accuracy to match. Really, really accurate. Open 24/7. Peaceful outdoors sounds. Always a clear sky waiting. No more frozen fingers. No skeeters. Lunatic Happy Hours. Southern Sky Sundays and Messier Marathon Mondays. Or maybe night sky coliseums. Huge fields with perimeter walls rising to block local light pollution and outlying city lightdomes. How much rain and cloudcover would it take? Will preserving an area’s dark skies eventually come to this? Um, 45 miles at least. I worked there many years ago and have used several earlier versions of that Zeiss star projector and have enjoyed scanning those skies with binoculars. I don’t remember ever having a program for the public to do that. Sounds like fun. I’m actually pretty amazed by this. I never thought anyone would bother to build enough resolution into these projectors to allow binocular observations. Was focus an issue? I imagine you had your bino’s focused from your last observing session, did you need to refocus them or were the projections at infinity? Was there any discernable texture to the dome? So fascinating! When I get a newer pair of binoculars, mine are horribly and irreversibly out of collimation, I’ll certainly try this out. Focus was a constant issue. Normally for stargazing I set the focus to infinity and them I’m good to go for a whole evening. In the dome, images might be project on parts of the screen that were anywhere from 15 to maybe 75 feet away, so I was constantly refocusing as I panned around the sky. It was a measure of how convincing the illusion was that the first time I had to refocus I momentarily said to myself, “What the heck!? I thought I had these things focused to infinity already.” Then I remembered where I was, and got used to refocusing a lot. It wasn’t onerous or anything, just something I’m used to setting and forgetting, that now I had to remember to do. The dome had no texture that I could detect. The illusion of looking at clusters and nebulae suspended against black space was surprisingly convincing. I went to the very same planetary at griffith observatory something like 4 years ago. there was some other show, talking about Galileo and the birth of the telesocpe. Can you give me some info on how to get those same tickets? The virtual star party Monday night was only open to members of FOTO–Friends Of The Observatory–and their guests. Steve is a member so he hooked Andy and I up with tickets. I should get a membership myself, I just haven’t gotten around to it. London and I were there this evening to catch a couple of new planetarium shows that we hadn’t seen before, and they were both excellent. Hi Matt! So glad you came to Griffith Observatory and enjoyed the Friends Of The Observatory presentation. If any of your readers are interested in attending programs such as this, they just have to go over to http://www.FriendsOfTheObservatory.org and check out the calendar. Although our programs open first to FOTO members, they are also available to the general public. Thank you for this great write up! Would you be willing to let me use an edited down version of this for inclusion in our magazine, “Update”? Thanks for the kind words–and for the correction about FOTO events. Please feel free to use an edited version for Update. Would it be possible for me to get a copy in exchange, once the magazine comes out? A copy will definitely come your way! If you would please send me your snail mail address to my email I will send you the Update article when it comes out in October. Thanks so much!!! I’m going up to Griffith observatory on Tuesday and immediately thought of this post. Apparently they don’t do this show any more, I’m kind of dissapointed because this sounded AWESOME. Hey Justin, good to hear from you. If they’re not doing that anymore, that is a bummer. It was a lot of fun.